Mondays are always a little lean in the farm vegetable department. Combine that with returning home from a three day weekend trip and you have a perfect storm for not having much in the fridge. After work I had no options other than to roll up my sleeves (or pretend to roll up my sleeves, since it's July), dig my heels in (the heels of my flip flops), and use a little old fashioned ingenuity in creating a respectable meal this evening. 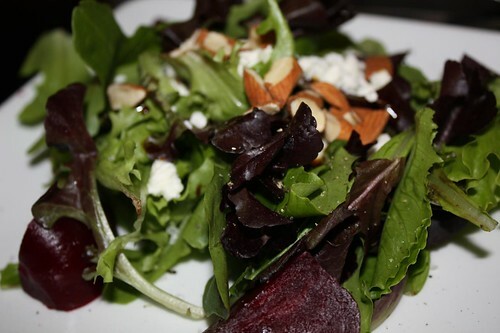 I started off by cooking some of the farm beets and serving them in a completely radical new way: with feta cheese and balsamic vinegar! My culinary experimentation knows no bounds. 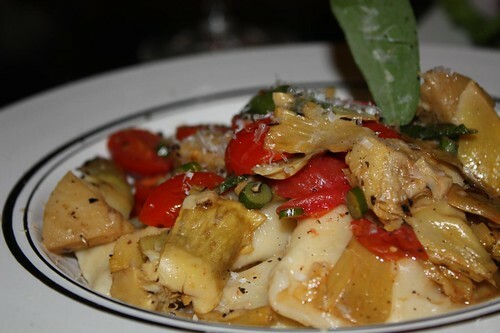 For the main course: pierogies with grilled artichokes, grape tomatoes, garlic scapes, and sage (from my mother's garden) with a light white wine and butter sauce. 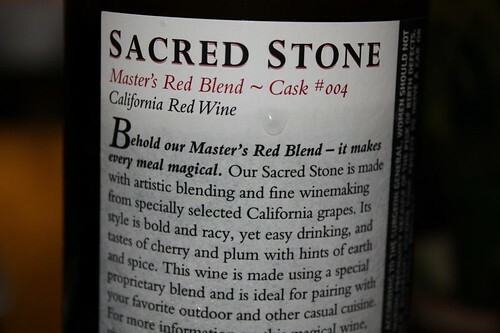 To accompany the pierogies we had a little of this magical Sacred Stone red wine. If you don't believe me that it's magical, just read the label on the back. It says it's magical right on the back! It also says that it's racy, much like the stand up comedy of Bob Saget. (It says it's racy, it doesn't compare itself to the comedy of Bob Saget, that was me). For a food pairing it suggests my favorite outdoor and other casual cuisine. I've never seen a wine paired with a food that was cooked in a specific location. 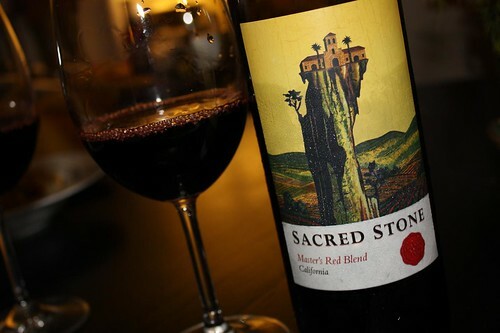 It is good to note, however, that this wine would work equally well with a buffalo steak marinated in Worchestershire sauce as it would with a light and crunchy cabbage salad. I guess that's just part of the magic.